Monaco Yacht Show 2015 will open its doors to visitors on 23rd September 2015 and will be a celebration of the events quarter century. For twenty five years the Monaco Yacht Show has been the tale of one city; Monte Carlo and throughout its history, it has always successfully developed great expectations. Twenty five years ago, the Principality of Monaco had no flagship yachting event of its own, despite already being the international meeting point for large yacht owners and their broker agents who arrived in Port Hercules to discuss sale, charter and refitting. Deals were struck, contracts signed and new yachts were built as a result of those meetings and the local authorities realised they should develop yacht business activities around this iconic venue. Those who attended the very first edition of the Monaco Yacht Show in 1991 recall that the entire event was staged along Quai des Etats-Unis with around fifty exhibiting companies, mainly from Monaco and the French Riviera eager to show their wares. Just a handful of foreign companies, took stands and 30 yachts whose average length was just 32 metres were made available to those who sought to inspect them. Two plus decades later, the show has moved on some! 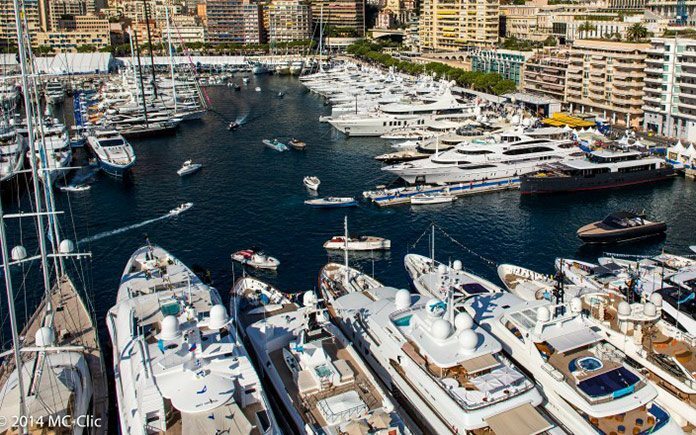 The same Monaco-based yachting businesses have grown as the Show developed into the world’s premier superyacht event. Few can argue now that Monaco is the world hub of the superyacht industry and the jewel in the industry’s crown is undoubtedly the Principality’s annual yachting show. In September 2015, the Monaco Yacht Show will deliver its largest ever event unveiling a record-breaking showcase of 121 spectacular superyachts afloat. The expected average size of these yachts, this year exceeds 47 metres. Five hundred exhibiting companies will display their most innovative, tailor-made products and services lying at the pinnacle of luxury yachting. What to expect in Monaco next September? Much has changed since MYS first opened, but there are similarities. Back then, as now, the world was on the road to recovery following a slump in financial markets. The conviction that now buoys up the superyacht industry in todays commercial climate, resembles that same buoyancy encountered in the early part of the 1990’s. Then, as is happening now, there was a new air of confidence, orders are being signed, designers are talking of ever larger tonnage and the myriad of service industries that surround the building of yachts are flourishing as a result. Visitors to this year’s show will have every reason to notice a spring in the step of those walking the docks. Being part of the enjoyment of the Monaco Yacht Show is attractive to many in the industry and as the industry expands so there are many new faces eager to share in that same excitement. In recent years there has been a surge in the younger buyer entering the superyacht market. Now instead of flying in from the USA or driving in from mainstream Europe, wealthy visitors are flocking to Monaco from all over the world. They bring not just their money, but also a new enthusiasm for tasting the good life of luxury on the water. For many years the world of superyachting had been one of the world’s best kept secrets, but the bubble has burst, and this new blood is not only keen to taste the adventure but is also hungry enough to devour it. Much of this new wave of excitement has come about following an awareness programme devised and implemented by show organisers working with partners in the Far East. It has created a better understanding by introducing the superyacht concept to an awakening audience. Organising events like Monaco Week in Shanghai and Beijing during June 2015 did a great deal to promote Monaco as a destination and also the superyacht industry to a Chinese social elite. Working with the Monaco Embassy in China and Chinese Media Partner; Blu Inc Media has done much to attract the visitor from the Orient. China Night in Monaco and the visit to the MYS by those VIP guests encountered in China will do much to cement a relationship with this burgeoning superyacht owning elite. Specifically catering to that marketplace the organisers have created the Sapphire Experience Pack. This limited edition series of just 100 packs has been reserved for the most illustrious of clients visiting the show. It allows them to enjoy an all-inclusive visit to the show that will include the boarding of superyachts, with lunch and champagne offered at the Upper Deck Lounge and notably includes and invitation to the MYS Gala Inaugural Party. A new exhibition layout for the 25th anniversary. Last year, the extension of the Monaco Yacht Show, presented a record exhibition of 115 superyachts afloat and 510 companies, met the strong demand of the industry and presented its best “yachting” offer to the visitors of the show. The new setting of the 2015 Monaco Yacht Show results from the decision of the Monaco Government to start the renewal works of Port Hercules for the construction of new underground car parks and the repositioning of the Museum of the private collection of antique cars of HSH Prince Rainier III. As a consequence, the historical exhibition area of the Darse Nord will move on Quai Antoine 1er. Quai Antoine 1er will therefore be able to deliver an aggregate of 2,825 sqm of surface area – divided into two air-conditioned exhibition tents (Quai Antoine 1er A – 400 sqm – and Quai Antoine 1er B – 2,425 sqm) – to relocate most of the exhibitors of the former Darse Nord tent. For 25 years, the Monaco Yacht Show Organisers have achieved to keep on delivering and developing one of the superyachting community’s favourite market hubs. Every year, 85% of the exhibitors renew their spaces in Monaco. In 2015, more than square metres, they have more importantly renewed their trust in the show. And for this, the show’s organisers guarantee they make every effort to listen and meet the needs of each of them with the finale perspective of celebrating the fascinating superyachting industry altogether. Monaco Yacht Show has become one of the biggest superyachting event in the world and offers attendees the unique occasion to meet with the finest companies, discover the latest nautical technology, learn about yachting services and get a first-hand look at the exsquisite vessels. The 2015 Monaco Yacht Show: Wednesday 23 to Saturday 26 September 2015.